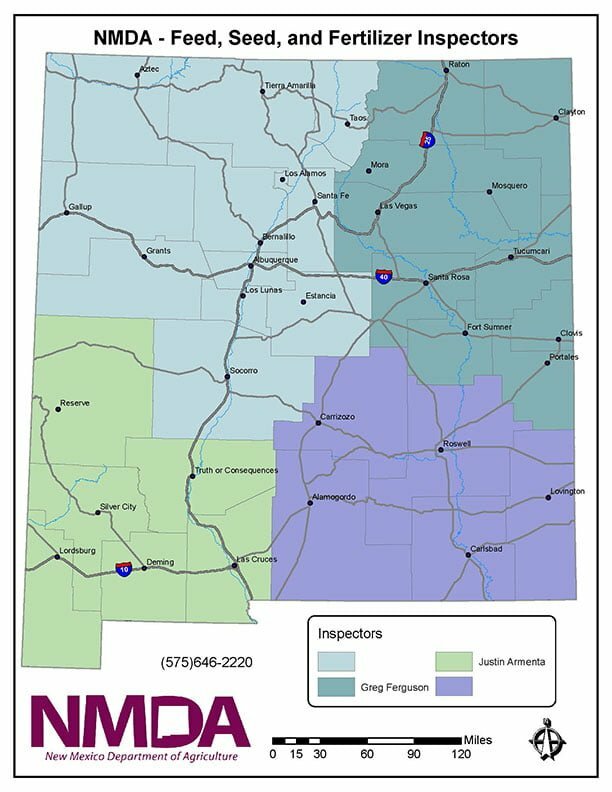 Inspectors with NMDA Feed, Seed & Fertilizer Section ensure compliance with the New Mexico Commercial Feed Act and Rule. This is done through routine inspections of feed manufactures, distributors, dairies, ranches, pet stores, and retail establishments. Along with inspections these members of our team provide much more. They offer customer service, education and assist in providing a safe and secure supply of commercial feed. All of this is for our New Mexico consumers! A great deal of this is accomplished by product sampling and analysis. This is performed by the NMDA’s Office of the State Chemist. It helps to insure that guaranteed analysis claims are accurate. It also ensures that product labeling meet standards set forth by the commercial feed act. In addition, Feed, Seed & Fertilizer inspectors work with the US Food and Drug Administration. This is done to monitor Bovine Spongiform Encephalopathy (BSE), commonly known as “mad cow disease”. They assure that all cattle operations are in compliance with the BSE Rule.